The REC TEC Wood Pellet Grill – Featuring Smart Grill Technology™ is one top of the line wood pellet grill. It is made using only the highest quality materials and combines it with unequaled workmanship. The result is a quality grill that delivers everything that REC TEC promises. You will be the envy of the neighborhood and everyone will be wanting one. The frame and majority of the grill are made from heavy duty steel and features an extremely durable powder coating that provides both good looks with years of corrosion-resistance. The cover features a porcelain enamel on steel finish that gives it a really nice color contrast and long lasting wear. The key to ease of use and great cooking results comes from the Smart Grill Technology™ built in that helps to deliver a much more consistent cooking temperature range from 180° F to 500° F. To help keep an eye on the temperature there is easy to read LED display. The heating chamber features a ceramic igniter for many years of uses. The extra large 19.5″ x 36″ cooking surface is one of the largest in its class and will hold a whole lot of food. The heavy duty all steel cooking grate will hold a whole lot of meat and other foods. It features a sturdy stainless steel shelf on one end and a steel bucket for catching the ashes on the other end. The grill is powered by 120v power, but the real cooking is fueled by the wood pellets that are fed from the 40-pound hopper. The burning pellets produce the most even and consistent heating of all grills in its class. While most other grills on the market are fueled by either charcoal or propane, but the REC TEC Wood Pellet Grill – Featuring Smart Grill Technology™ is much different. The heat in this grill is produced by the igniting and burning of a solid fuel made with wood products. The wood is pressed into small, uniform sized and shaped pellets. The pellets that fuel this grill are made from a number of different hardwood materials like Hickory, Apple, Cherry and Hard Maple. These hardwoods produce a whole lot of heat and lots of aromatic smoke that truly enhances your meats as they are cooking. You can choose from a number of different varieties of pellets that are made from hardwood. More expensive upfront costs compared to traditional gas and charcoal grills. However, for the increased cost, comes more uses. As with any grill, you have to keep it clean! Compared to traditional grills, there are more moving parts. 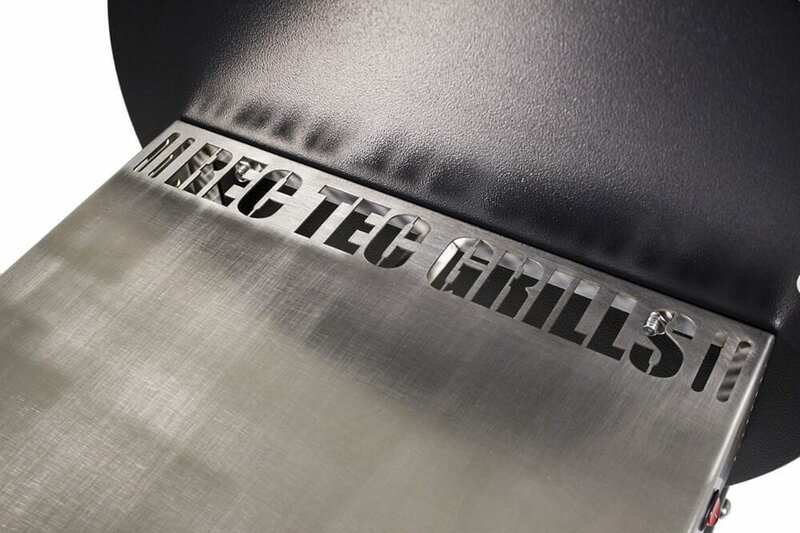 We scoured the web to find what consumers are saying about their REC TEC grill. We do this so that we can add a section to our review that covers what consumers that have purchased one have said about it. Below is kind of a summary of some of the things that were said about it. Several people who posted reviews online had this to say about it: “This grill is the absolute best BBQ I have ever used, it cooked a perfect steak that I have ever tasted”. Another person said this of their recent switch to wood pellet from charcoal: “I have been using a charcoal type grill for many years, that is until I tried the REC TEC Wood Pellet Grill – Featuring Smart Grill Technology™, I will not be going back to charcoal again”. The REC TEC Wood Pellet Grill – Featuring Smart Grill Technology™ represents a brand new technology to the already crowded BBQ grill market. There are so many different brands and models of gas and charcoal grills that it might surprise you that the wood pellet grill has found itself a nice little spot in the hearts of some very enthusiastic outdoor grillers. With more and more people cooking out, having such a highly versatile grill really works perfectly for them. The Smart Grill Technology™ built into the REC TEC Wood Pellet Grill makes cooking a wide range of meats and other foods on the grill a snap. Who would thought you could bake just about anything on this grill including a pizza? The wood pellets that fuel this grill are also much cleaner burning which is much better for the environment than charcoal, gas or propane. The wood pellets come in a variety of types that produce a wide range of smokey flavor to enhance the taste of your foods as they are cooking. Based on all of the research of the REC TEC Wood Pellet Grill – Featuring Smart Grill Technology™ for the review and the fact that it is one of the highest consumer rated pellet smoker, we would have no problem calling this the best pellet grill in its class. If you are in the market for a new grill to replace your old one or getting your very first grill, the REC TEC Wood Pellet Grill – Featuring Smart Grill Technology™ would be a really good choice. If you would like some additional information or to find out where you can get one for yourself, just click here.